Almost everything about Pymatuning State Park is big. At 16,892 acres, it is one of the largest state parks in the commonwealth. The 17,088-acre Pymatuning Reservoir is the largest lake in the commonwealth. Pymatuning is one of the most visited state parks in Pennsylvania. 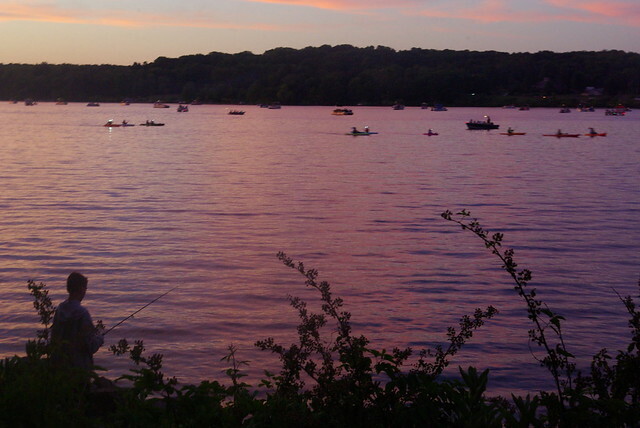 Perhaps the biggest thing about Pymatuning is the fun you can have boating, fishing, swimming, camping, and enjoying other recreational opportunities. In addition to the state park facilities, the Pennsylvania Fish and Boat Commission operates a fish hatchery and visitor center, and the Pennsylvania Game Commission has wildlife viewing areas. The park office is open specific hours. The beaches, overnight areas, and other areas are open specific seasons and hours. Contact the park office for facility seasons and hours. The south shore of the park, including Jamestown Campground, boat launch, beach, cabins, picnic areas, group tenting, and the park office, can be reached from US 322. The north shore of the park, including Linesville Campground, beach, picnic areas, boat launch, marina, and cabins can be reached from US 6. The east shore of the park, including Tuttle Point, beach, picnic areas, boat launches, and Espyville Marina can be reached from PA 285. Anywhere along the lake, beautiful vistas of this large body of water can be enjoyed. Some of the more unique sights include the dam, the Linesville “spillway,” the fish hatchery, and the two causeways across the lake. The spillway is perhaps one of the best known locations because the fish are so plentiful that the “ducks walk on the fishes’ backs” to compete for the fish food tossed in by visitors. Popular areas to photograph the sunsets at Pymatuning are the Spillway, Linesville Beach, the causeway, and Jamestown Main Beach. While the setting sun makes beautiful photographs, wait a few minutes after complete sunset to capture the afterglow where you will often have brilliant oranges and yellows for those postcard shots. Pymatuning State Park offers a wide variety of environmental education and interpretive programs. Through hands-on activities, guided walks, recreational experiences, and evening programs, participants gain appreciation, understanding, and develop a sense of stewardship toward natural and cultural resources. Kayaking along the shores gives the visitor a close-up view of songbirds, waterfowl, eagles, and glacial geology. Programs are offered year-round. For information about upcoming programs or to schedule a group program, contact the park office.